Time Of Flight Mass Spectrometer Components from Jordan TOF Products, Inc.
Our Time Of Flight (TOF) mass spectrometer components are designed to generate, store, separate and detect ions. They are designed to be used as components in specialized TOF mass spectrometry experiments using laser ablation, desorption or electron bombardment ionization. 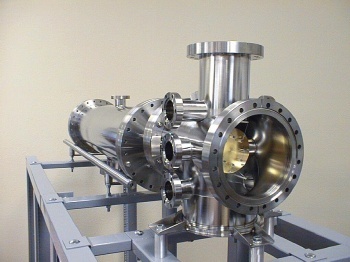 A stand alone TOF mass spectrometer can be created by adding vacuum pumps, laser, data acquisition, etc. 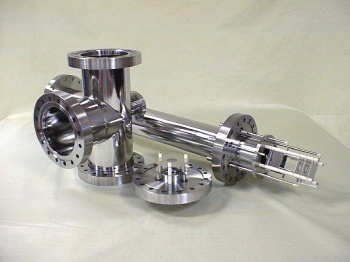 Standard UHV flanges, components, and construction techniques are used throughout. This gives design flexibility and allows later changes if desired. It is necessary for the customer to purchase vacuum pumps, laser windows and data systems. This may be troublesome and time consuming, however, this disadvantage is offset by a considerable cost savings. 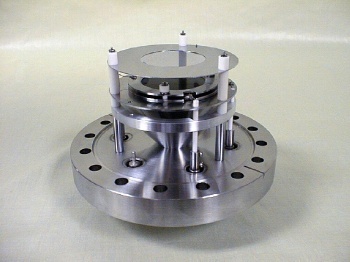 A chamber can be furnished to mate with the user's vacuum system flange, or the instrument can be modified to fit into the user's existing vacuum chamber. Custom Time Of Flight (TOF) Mass Spectrometer configurations are available. 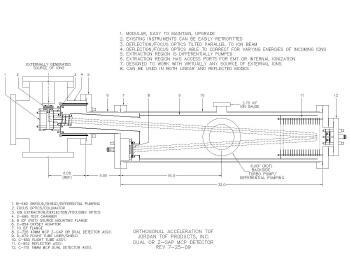 Designed for the researcher who requires higher resolution than can be obtained using our linear instruments. Modular construction from standard vacuum hardware makes custom variations or later modifications easy. Although this type of equipment is complicated in theory, it is mechanically quite simple and easy to use. Reports indicate that our customers spend very little time getting their systems up and running. Resolution of 1500 has been obtained without extensive tweaking or other techniques to enhance initial performance. Resolution of over 4000 has been obtained when used with our Shroud, Skimmer, Pulsed Valve and Egun. Sensitivity has so far been good with both pulsed beam and surface ablation experiments. Designed specifically for TOFMS analysis of externally generated ions brought in orthogonally from virtually any source. Typical source of ions: Electrospray Ionization Source (ESI), Plasma Source, Nanospray Source and MALDI. Performance is optimized for external ions with energies of 5eV to 15eV, typical energies of ions from an RF only ion guide/ion transport mechanism. Deflection/focusing source optics able to correct for incoming ions of much higher energies. Extraction region is differentially pumped. Two orders of magnitude of vacuum differential from chamber to extraction source/flight tube can be obtained with a relatively small turbo pump on flight tube sideport (250 lps typical). It can be used in both linear and reflected modes (oaTOF and oaRETOF). Designed to enhance the sensitivity and versatility of our TOFMS instruments by providing long term ion storage in the source region. A drawback of TOF devices is the lack of a means of storing ions prior to analysis. This inability to store ions compared to trap methods such as FTICR and ITMS place TOF at a disadvantage in terms of being able to manipulate ions for MS/MS or ion-molecule experiments, or for enhancing sensitivity through storage and integration of the signal. 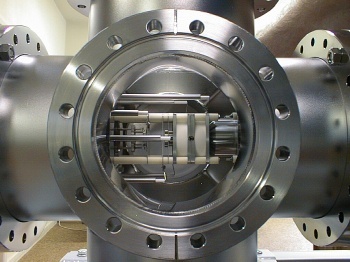 The QUADRUPOLE ION TRAP can be used to overcome these limitations. Ions can be created and stored during the time between extraction pulses. Approximately 125 microseconds are required for Ion extraction and return to trapping RF potential. It can be seen that duty cycle approaches 100% for storage times of over 10 milliseconds. A flexible and inexpensive instrument which can be adapted for use in the customers chamber. Can be mounted in many different orientations. 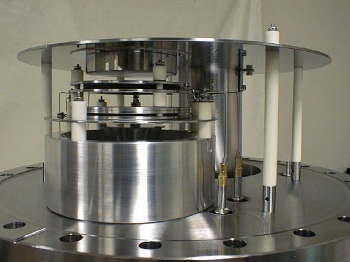 The chamber can be furnished to mate with the user's vacuum system flange, or in some cases, the instrument can be modified to fit into the user's existing vacuum chamber. RESOLUTION: Approximately 150-200 with gas phase molecules and Laser Excitation Ionization. Can be as high as 1000 with Supersonic Molecular Beam and Surface Ionization. The Electron Gun with its power supply can be used to inject electrons into a vacuum chamber. These electrons are primarily used to generate ions by electron impact. 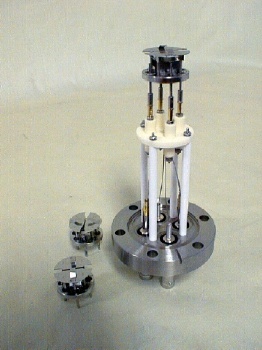 When used with the Pulser, it can be used as an EI source for a TOF Mass Spectrometer. Electrons are emitted from a hot wire filament and accelerated to an energy level which is adjustable to between 40 and 100V. Most of these electrons are collected by the first lens element and are displayed on the meter as Emission Current. About 10% of them will pass through the slit and past the second lens element which is connected to the Focus Voltage. They then pass through the split lenses which are mechanically touching the Grid Plates of the Ion Source. The Egun and Power Supply were designed to operate at the potential of the Grid Plates which can be as high as 3500VDC continuous.The Egun is mounted on a standard 2.75 CONFLAT flange. The Filament Assembly is one inch in diameter and will extend into the vacuum as far as requested in order to make proper contact with the grid plates. Designed to handle the fast ion pulses provided by our linear and reflectron Time Of Flight Mass Spectrometers. Our MCP Microchannel Plate Detectors have a 50 ohm coaxial output and provide high gain (10e6 to 10e7) with sub-nanosecond rise time. They are fitted with SHV coaxial UHV feedthrus that can be operated from external power supplies or voltage dividers. All of our MCP Microchannel Plate Detectors are fitted with a 90% transparency input grid. This presents a flat, field free plane to the incoming ions. The input grid has its own SHV feedthru and can be operated at any potential. A shorting cap is provided for operation at ground potential. Our divider circuits are close coupled to the detector by way of short SHV cables which results in low noise, clean signal with no ringing. All dual detectors can be used to detect either positive ions, negative ions or electrons by simply using different input voltages/divider circuits. A special three plate MCP Microchannel Plate Detector is also available for detecting small signals. The addition of the third MCP and suppression grid offers much higher gain, better signal/noise ratio, and a higher input/acceleration voltage for incoming ions. Also fitted with an input grid, the Z-Gap MCP Microchannel Plate Detector provides incoming ions with a post acceleration voltage of nearly -5KV. Z-Gap MCP Microchannel Plate Detectors are available with 18mm, 25mm or 40mm Microchannel Plates. Note: Z-Gap detectors cannot be used to detect negative ions or electrons.